Those two were myself and fellow photographer Doug Chinnery. Many of you will know Doug suffered a rather nasty fall in Glencoe in January, badly fracturing his ankle and fibia, and has been laid up since, leg in plaster, and unable to do his field workshops for quite some. However, despite the injuries, and having to cancel several of his popular field workshops, Doug has remained incredibly optimistic. In fact I say Doug is one of the most optimistic persons I know. That aside, I do know he has been itching to get and a take some photographs, especially since acquiring a new 5D mark-III at Focus on Imaging a few weeks ago. We’d been planning to have a day out for quite a while, to locations where Doug could shoot from the car or a wheel chair, and had contemplated Saltburn as a potential venue. But as each day approached, the predicted forecast grew grim, and our trips subsequently postponed, only to be greeted each following day with a glorious sunrise, not the dull, dark, dank, overcast skies foretold by the boffins at the met office. What was going on? Come Thursday, now heavy snow storms were forecast. I didn’t recall any mention of those at the beginning of the week? This time last year we were sat out in the garden, sunbathing, adorned in our summer shorts and stoking up the BBQ, enjoying a mad March heat wave and a glorious 21 degrees Celsius. But snow, in March, in spring time! Oh the English weather, so predictably unpredictable! Doug loves the snow; so do I come to think of it, so this would perhaps be our last chance of the season to photograph snowy landscapes. A chance not to be missed then, so despite the amber warnings, we duly ventured out. I’d left the itinerary entirely up to Doug as he had a few locations in mind, and knows the odd nicely formed old tree, stonewall or old barn or two, as we headed off towards Hathersage moors. The winds were really strong and the snow still coming down thick and fast; at times almost horizontal; blizzards conditions prevailed and this was no place to be without 4-wheel drive. Although the roads and weather were bad, the up side was that the roads were almost empty, so stopping almost anywhere to take a picture became possible. We could saunter along at a snails pace without holding anyone up, taxing to a precise place and orientation to frame our subjects from the car window; a luxury you’d never encounter on a normal day. We stopped in the car park opposite Lawrence field to shoot the copse of Birch trees there. 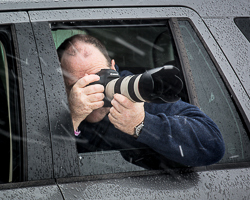 Doug shot within his EF 70-200mm, f/2.8 L, from the rear car window, whilst I briefly ventured out into the blizzard with my 70-300mm f/4-5.6 L. After only a few of minutes I was absolutely frozen and at times struggled to keep still in the winds; the snow was horizontal. Doug definitely had the right idea and I retreated to the car. From then on, we let the conditions dictate, and my 70-300mm never left the camera, and my tripod never left the boot. I was pretty sceptical at first, wondering whether I’d get any good shots shooting like this, but after a few hints from Doug I was beginning to see some images I liked on the rear LCD. This was like Safari shooting. I’d turn the engine off to reduce vibration, and sometimes use the window half up, or the door frame as a rest to help steady my shots. Image stabilisation is a godsend for this type of shooting, but even so I tried shots at ISO 200 up to 800, with most shot on ISO 400, knowing full well that the 5D mk-III is capable of recording practically noise free images at these settings. Many of the subjects were in the distance so depth of field was not really a worry. My aperture settings ranged from F/8 to f/11 most of the time, but I would also try to make sure my shutter speeds were high enough to capture sharp images, and I generally shot around 1/200th second or above, slightly higher for the longer focal lengths if possible. We tried a few slower speed of course; some to get the snow streaking across then frame, but I found I preferred those where the snow was almost frozen in time, which created an arty quality to the pictures. Doug, I’m sure experimented far more, but he did persuade to me to attempt my first ICM using the blending mode on my 5D mk-III. I’ll save that result for a Flickr posting sometime. After Hathersage we travelled through Castleton and shot some snow covered fields and dry stone walls below Winnats Pass, but the surprise of the day was Winnats pass itself, which with a light dusting of snow looked simply amazing. A lone tree stands atop of the first peak on the right which we shot from the car park opposite the entrance to Speedwell Cavern. 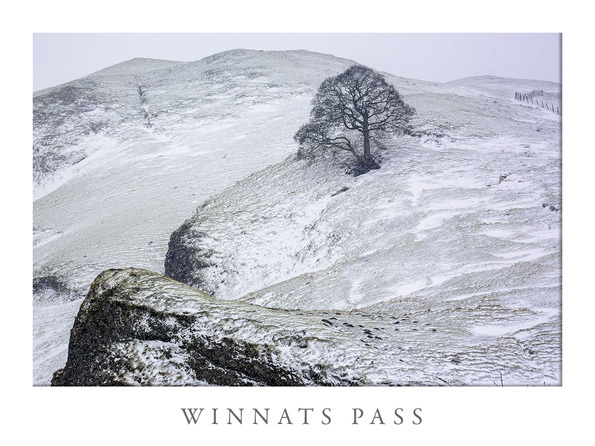 I’ve driven up Winnats pass many times but have never noticed that tree, which in the snow stood out quite majestically. We headed up Winnats Pass which by now was thick with snow. 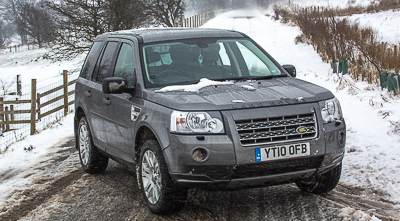 The car in front had failed to get up, but the Freelander took the steep incline in it’s stride and soon we were on top. I think we may have been the last vehicle to get up for quite some time that day. We drove over the pass by Mam Tor and down into Edale valley, but by now the snow was coming down so thickly we could hardly see the other side of the valley and the photo opportunities seemed to dwindle. After a rather enjoyable lunch in the Ye Olde Bowling Green pub in Bradwell, we headed up the old Roman Road, Balham Gate, onto the hills upon Bradwell Moor. The weather had abated somewhat, but the narrow lanes on top were strewn with drifts, which in places had straddled the road with humps of snow often a couple of feet deep. These posed no problem to the 4×4 but muggins here decided to try a 3-foooter and duly got stuck. Luckily it didn’t take long to dig out the snow around the front tyres, then wracking the steering back and forth we re-gained grip and were able to reverse out the drift. Doug did look rather relieved however, as we were, by now, in a rather remote location. After my folly, we decided to head down a lower route and spent a most enjoyable few hours sauntering down through Coplow Dale towards Little Hucklow, where numerous lone trees, small coppices and an veritable array of stone walls presented themselves for subjects. It had started snowing again, but this only added to the beauty, and at one stage there seemed to be shot every few hundred yards. On the more open areas the road was strewn with drifts, and one driver in a large 4×4, stopped and warned it may be difficult to pass lower down, but we encountered nothing as bad as we had on Bradwell Moor and arrived in Little Hucklow without event. From then on we started heading back through Eyam, and up to Grindleford, before some new roadside opportunities presented themselves near Padley Gore. Here the snow fall had been much heavier, with a much thicker carpet of snow, and the snow on the oaks looked amazing. By now, we almost had our fill and started to head towards home. Doug shot from the back window of the Freelander all day, and I probably took most of my shots from the car too, but I did get out at some locations to reframe, although never ventured far from the car. It snowed almost constantly, sometimes quite heavy, and in parts was hellishly windy too, blizzard conditions. But it worked. The landscape took on a new dimension when snowing, even in the blizzard, and scenes that we’d not noticed before, suddenly jumped out at us in the white, wintery landscape. Of course we probably over-shot the “lone tree”, (well at least I did), but who can resist that. At the end of the day we both felt we’d acquired some really good shots and spent a most enjoyable day achieving it too. It just goes to show you don’t always need a tripod, drive-by shooting can work too. One thing I would recommend however, is to have a good quality zoom lens, and both the lenses we used are pretty darn sharp and ideal for this. I’ve selected a few shots from my first pass at processing that I quite like and put them in a little slide show below. More will probably follow on my Flickr account no doubt, and Doug’s posted one on Flickr too. I hope you like them. I shudder at the thought of you heading out in those conditions (but maybe that’s because I know it would be a disaster in my 12 year old Ka!) but some of those images you took are beautiful. I love the way the contrast is reduced and depth of field is more pronounced as everything fades out in the distance. It all looks so serene. You would never have known it was blowing a blizzard! Yep, deadlines are tough … but there could be more snow for Friday. Doug and I are contemplating a repeat performance.